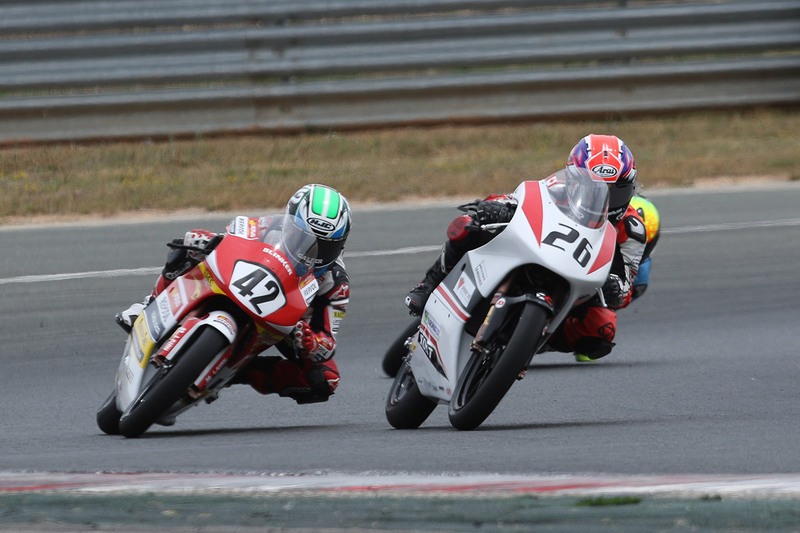 Circuit de Navarra in the Spanish province of Navarre was host of Round 5 of the Spanish RFME Campeonato de España de Velocidad National Championship. Looking to carry the momentum of two top ten finishes earned at the double round in Alcarràs, 13-year-old Canadian Jonathan Finn and the XCTech team set out to continue to work towards the front of the grid. With nothing but sun in the forecast for both qualifying and race day, Finn would have perfect conditions to learn the 3.9km, 15-corner circuit. “I am really enjoying the variety of circuits so far this season racing here in Spain. The Navarra circuit is challenging but I have been able to adapt really well to this circuit,” said Finn. With temperatures reaching into the high 30°C, Finn’s main concern was his ability to deal with the ambient heat. “Practice on both Thursday and Friday’s, the temperature got up to almost 40°C which is something I really haven’t needed to deal with. I hade to make sure that I stayed hydrated in order not to have the heat effect me physically on the track which helped out a lot. I was able to find time and improve every session out. I was really happy with my progress and knew I could go faster. I just needed to keep completing as many laps as I could,” said Finn. Saturday’s qualifying practice sessions would prove to be a good learning experience for Finn in tactics. “I was really happy with our bike set up and my lap times were really competitive during practice, so going into QP1 and QP2 I was confident I could get a good qualifying position. Unfortunately I ended up towing other riders in my draft and would slingshot around me down the start/finish straight” said Finn. “Its just another part of the qualifying game that I am still learning here.” Finn was able to qualify in 13th position for Sundays race. Jonathan Finn returns home to Canada for a two-week break until the RFME CEV series travels to Motorland-Aragón near Alcañiz, Spain for round 6 on the calendar (16 July). Finn and the XCTech Team are eager to see Jonathan continue to improve and push towards the front at Motorland-Aragon.